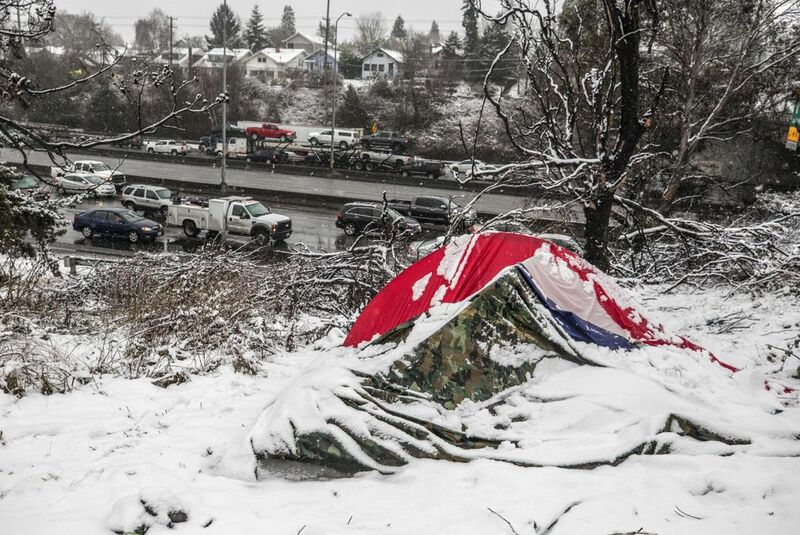 Forecasts of severe winter storms in the Seattle area prompted the opening of more emergency homeless-shelter beds and outreach to the city's hundreds of unsanctioned tent camps, with one goal in mind: survival. The Puget Sound region’s frigid temperatures proved deadly as a 59-year-old man, who may have been homeless, died from exposure while at the Sodo light-rail station. A Link light-rail train operator found the man, Derek C. Johnson, facedown on the pavement near the train platform, sometime before 5 a.m. Thursday at the transit station. He had no permanent address. It was the first hypothermia-related death reported by the King County Medical Examiner since temperatures fell earlier this week. The more than 5,000 people living outdoors in King County are the most in danger. Here are a few numbers to keep in mind. For shelter: King County’s 211 service has experts on shelters, but also on food, housing, rent assistance, legal assistance, financial assistance, health care and employment. For emergencies: Call 911. If the person you’re calling for is under the influence of drugs or alcohol and wants to sleep it off, ask for the sober van if you are near downtown. 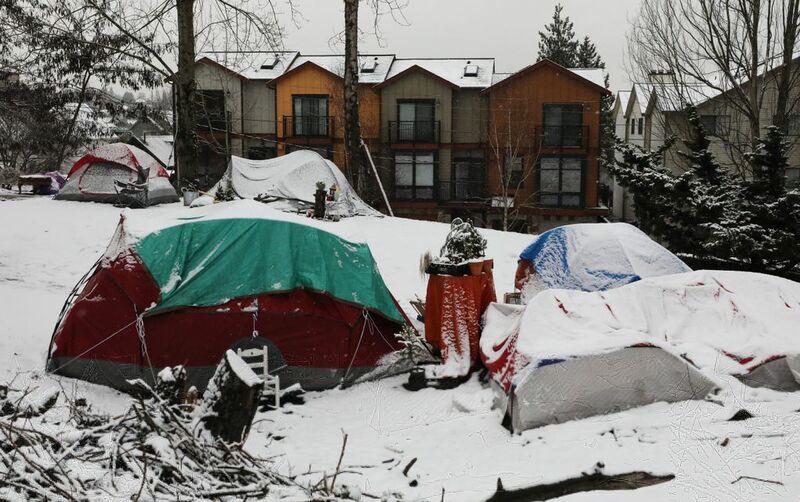 Johnson’s death punctuated what is at stake as Seattle and King County homeless-service providers brace for multiple days of snowfall and freezing temperatures predicted over the coming week. Their focus is singular: ensuring survival for the thousands of people living unsheltered in King County. That’s meant opening shelters and paying for motel rooms —anything they can do to reach people who need help. Both the city and homeless-service provider Mary’s Place opened shelter space for families Friday, as shelters across the county neared or exceeded capacity. King County also added more capacity, for adult men, at one of its facilities. The message was, simply, come inside. “If you come to one of our shelters, we — the county, the city — we will find a place for you to be safe overnight,” said King County Executive Dow Constantine, at a news conference with Mayor Jenny Durkan. Johnson was on the light rail and got off a train at the Sodo station around 11:30 p.m. Wednesday, an hour and a half before the trains shut down for the night, said Kimberly M. Reason, spokesperson for Sound Transit. A train operator later saw him lying on the platform as the train pulled into the Sodo station for the morning run, which begins at 5 a.m. It was not immediately clear if Johnson had had contact with any shelters in recent days. He lived at the Frye Apartments in downtown Seattle in 2017 but had since left, according to the Low Income Housing Institute (LIHI), which manages the Frye. LIHI Executive Director Sharon Lee said her staff believes Johnson had housing and services elsewhere but they could not confirm that on Friday. As concerns about the winter storm increased, Seattle officials announced the city would keep its emergency overnight shelter for adults at Seattle Center’s Exhibition Hall open for another week, through Sunday, Feb. 17. Burien also opened emergency shelter for adults. Seattle is also opening shelter space for families at the Garfield Community Center. 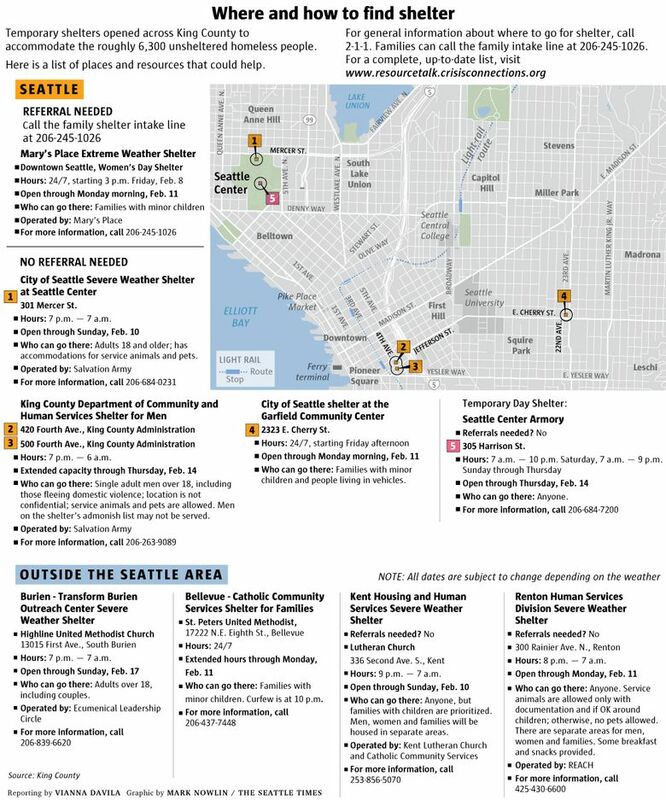 Until today, all of the walk-in, winter-weather shelters in Seattle had been for adults. Homeless-service provider Mary’s Place also opened up more 24-hour space for families at its Women’s Day Center in downtown Seattle, calling in volunteers and even former staffers to help operate the site. Agency spokeswoman Linda Mitchell said the family shelters are always full, regardless of the weather. With the snow, “We are way beyond capacity,” Mitchell said. Bellevue, Kent and Renton have opened shelters that will accept families with children under 18. Already, in Renton, space was getting tight. 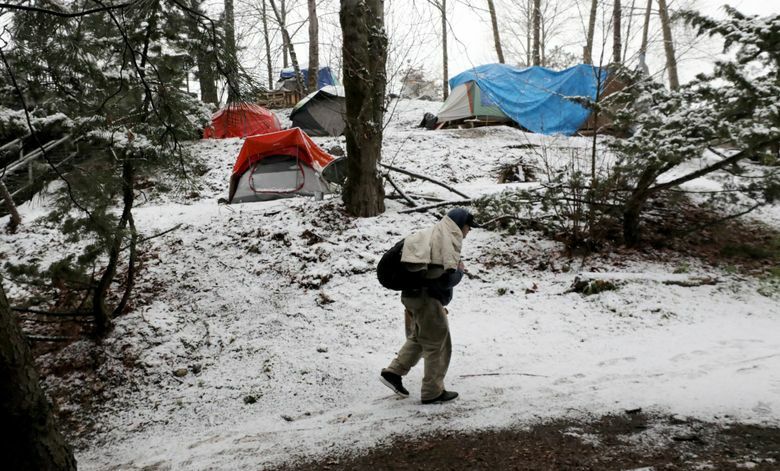 Seattle’s Navigation Team, which does outreach to the city’s unauthorized homeless encampments, has been going to tent sites since Tuesday and plans to work through the weekend. Snow prevented the team from working Monday. This week, the team — a mix of police and outreach workers — focused on the city’s larger encampments so they can reach the most people at once, said Will Lemke, the team’s spokesman. Police officers have also been transporting people to shelters in vans wherever space is available, a service the department said it would offer through Wednesday. “Please call 911 if you believe someone is cold & in need,” the department posted on its Twitter account Friday. Generally, Lemke said, people have been more receptive to taking up offers of shelter this week than is typical. But no one is forced to go inside because of the weather, and, presently, the city is not closing down any encampments. The city is focused on getting people who are willing inside, Lemke said. More homeless people were recorded living in vehicles than tents in King County during last year’s one-night count, but there is no large outreach team in Seattle focused exclusively on vehicle campers. However, even before this week’s snowfall, the Police Department’s Community Police Teams have been regularly reaching out to people living in vehicles, Lemke said. The shelter space the city opened at Garfield Community Center is also meant to accommodate people living in vehicles, Lemke said. Local shelters, which are often at capacity, rely on the city and county to open emergency cold-weather shelters during a crisis like this, said Noah Fay, housing director for Seattle’s Downtown Emergency Service Center. DESC is usually full every night, Fay said, but sometimes goes over capacity in dire emergencies. Chloe Gale, executive director of the homeless-outreach organization REACH, said her staff has moved some of their most vulnerable clients into motels in North and South King County because there are no large, walk-in shelters in those areas. “We’re very worried that so many people will be left stranded outside in the snow over the next few days,” Gale said. 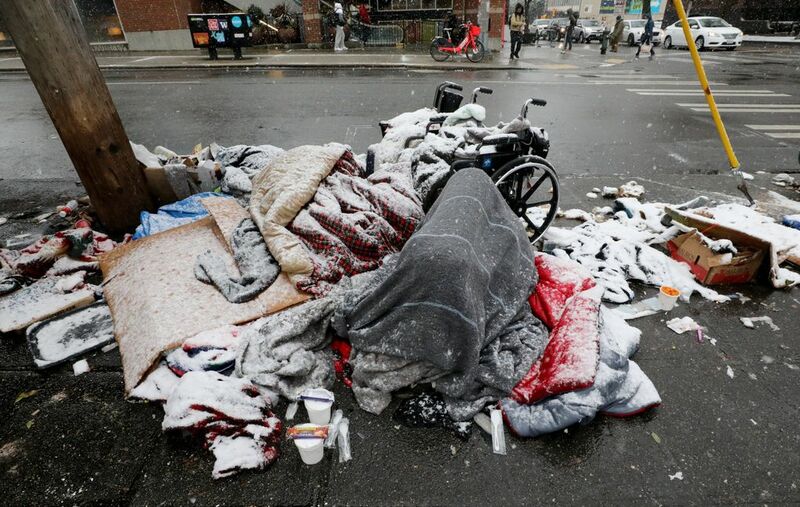 Seattle Times reporter David Gutman and Project Homeless engagement editor Scott Greenstone contributed to this story.